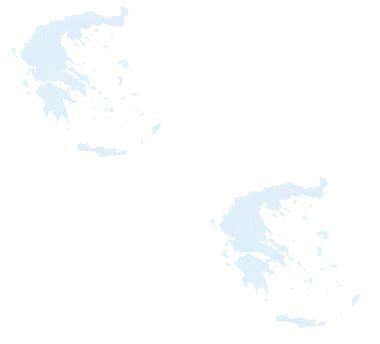 For a general map of the Meteora area, click here!(55K). for 112K rates and above. To go back to the Stereá Elláda main page, click here! 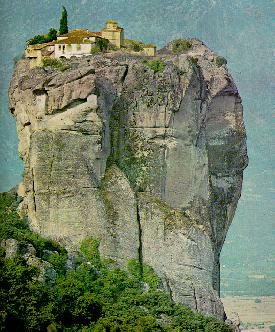 Metéora is an area of Greece with unique history and sites. Here are monasteries constructed on sheer rock surfaces, where even eagles have trouble landing, never mind humans. Metéora is a site of huge rock formations, turned over into monastic sites which could remain free and removed from everyday life allowing the inhabitants to learn the divine principles of God and lead an ascetic life over epochs ranging in centuries. 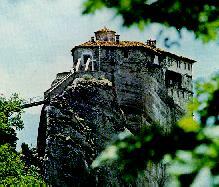 The Metéora region has been featured in many a film including the James Bond "You only live twice," staring Roger Moore. For those interested in really wild places, which have become more reachable; where one can close the eyes and imagine incredible solitude joined by sweet wifts of pure clean mountain air; where the eons that are passing by, take histories along with them; Metéora is for you. To get to the region, you can either take the train (currently not available all the way), car or Bus. By train, you take it either from Athens or from Thessaloniki to either place or to Lárisa from Athens, Lamía from Thesaloniki, and change at Stavrós for the narrow gauge train for Kalambáka, the nearest town to Metéora (alhtough this is currently not running). By bus, you take the bus to Metéora from Athens or from Thessaloniki, which take you directly to the monasteries or to Kalambáka. By car, from Athens you go towards Lamía, and then take direction Kardítsa, Tríkala and then Kalambáka. This is the main road to Ioanina through the Katára pass (1705meters). There are many monasteries in the area, and they can be explored on foot in just a single day. Please note that you should wear long trousers (loose, thin trousers are fine), and ladies should wear skirts covering ankles. 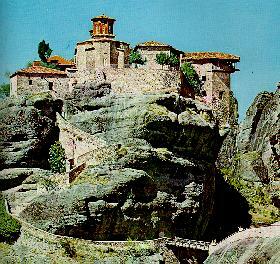 This monastery, which is found 415 meters above the plain, is reached on steps carved into rock. Before 1923, ascent was done with the use of rope ladders while in previous times, ascent by basket was the main method. 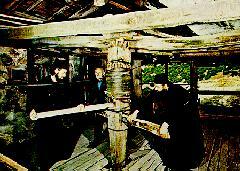 The basket that was used was tied to thick rope and was raised and lowered with the use of rotating mechanisms driven by monks. The monastery of Transfiguration has a beautiful Katholikon, a sanctuary and was constructed in 1382 by the founder of the Monastery. Many lovely murals abound for everyone's view. This monastery, created in 1350 by the monk Varlaam and subsequently rebuilt by the brothers Nectarios and Theophanis in 1518. Originally, the ascent was done using scaffolding dug into the rock, an idea that was later used by all the monasteries of the area as a means of bringing equipment up. Later, ascending houses were built and using a system of pulleys, building continued efficiently. The All Saints church dominates the monastery, which is filled with beautiful murals, painted over centuries by the various monks. This monastery is situated on a rock, which is just about big enough for it, with its walls built right on the rock's edge. 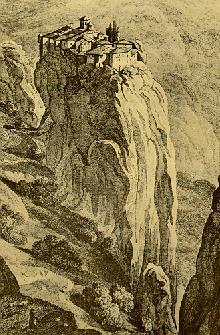 Until the end of the last century, rope ladders were used, later to be changed into strong cement bridges linking it with the nearby mountain, for access. The monastery was founded in 1288 by Monk Rousanos and later rebuild. It is adorned by well maintained wall frescos. 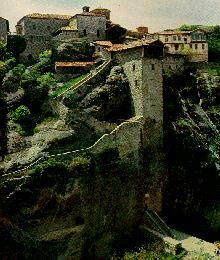 This is an amazing complex of buildings, built right on a steep rock, about 480 meters above the plain below, with the original ascent done with rope ladders and baskets (which are still in use today to ferry material and visiting monks). It and its church, were built around 1470 with later buildings added subsequently. The churches (there are two) have an amazing collection of wall frescos, well worth seeing. Outside the church is a courtyard leading to a vista point from where the entire surrounding area can be seen. The site of this monastery was used for the James Bond film "For your eyes only" with Roger Moore. Towards the end of the film, the monastery is used as a prime stage. See parts of the film here.